It was a day off for many in Ludlow and Shropshire. All schools in our town were closed, along with a few shops. The market began a five day shutdown. Many people were forced to begin a long weekend. Train spotters had a dismal day. Not a train in sight. But Minsterley kept a basic town bus service running. Thanks guys! But, hey! It was a day for the kids. A great day for the kids. 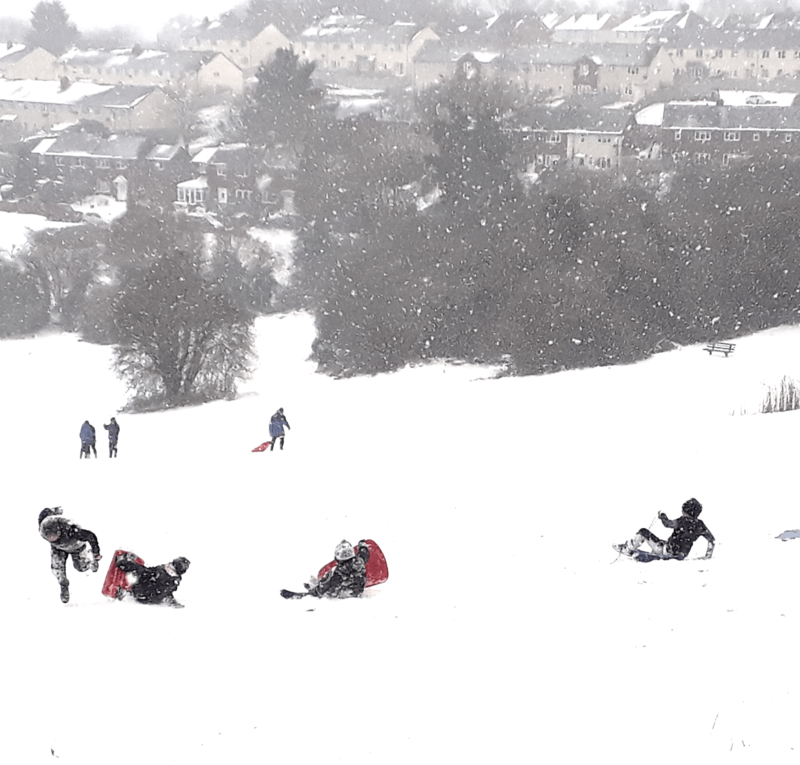 We saw many variations of Olympic Winter Sports on Gallows Bank. Snowboarding, skeleton (aka the tea tray) and unsuccessful attempts at various jumps. It was spills galore and all the more fun for that. It wasn’t as cold today as it has been because the wind dropped. But of course, the snow fell overnight and through the afternoon. Residents and shopkeepers cleared pathways. Shropshire Council contactors and farmers cleared main roads and gritted some town centre pavements. I am never certain what Ludlow Town Council does on these occasions. Shrewsbury Town Council’s labour force have been out for two days working in partnership Shropshire Council’s team from Ringway. That’s the model we should have in Ludlow. Shopkeepers and residents have as always done us proud. Please be a good neighbour and clear a stretch of pavement if you are fit enough. Chilly conditions are predicted to continue over the next few days. That means dangerously icy pavements as the snow turns to slush and refreezes. If everyone who can manages to clear a short stretch, it would be better for everyone. It would help keep our town moving and reduce the incidence of slips and falls. Can you clear snow without a risk of being sued? Of course you can! Here is some very clear advice from Shropshire Council. Arriva Train Wales has its lips sealed tight shut on whether there will be trains tomorrow or Sunday. This is partly about the weather. But its train fleet also has sustained damage to the wheels of many units, possibly due to a track fault. I’ll update on trains in the morning but expect the cancellations through to Monday at least. Hurrah for Roger Curry making life easier for the elderly and infirm of Dinham. Ironically the Council tax for his shop is increasing by 70% . I wonder if any of that will go to help with clearing pavements next time it snows.